We are happy to premiere our very first music video! It is for the song “That Part of You.” It was directed by Bill Poff and we love it! Especially in HD! Please watch it, rate it, comment on it, link to it! AND MOST IMPORTANTLY, EMBED IT WHEREVER YOU PLEASE! Below is a link to the video on Vimeo. You can watch and even download it there in HD. We couldn’t have done it without the help of the following people! Thanks so much to everyone who contributed to this project. You guys made it happen! 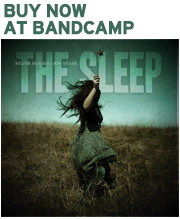 In the very near future, The Sleep will be releasing their first music video from the album Never in a Million Years. In the meantime, check out some photos taken at the video shoot.